So I bought a Yukon Yak last year and after reading all about the walking and floating trips of Roman, Erin and Hig, AMWC, BMWO, etc… I was jonesing for a longer trip of my own here in the southwestern USA. Preferably a 50/50 mix of walking/floating. Floatable adjacent rivers seperated by a umountain are hard to come by around here so I settled on finding routes to hike up or around a river and then float back down. 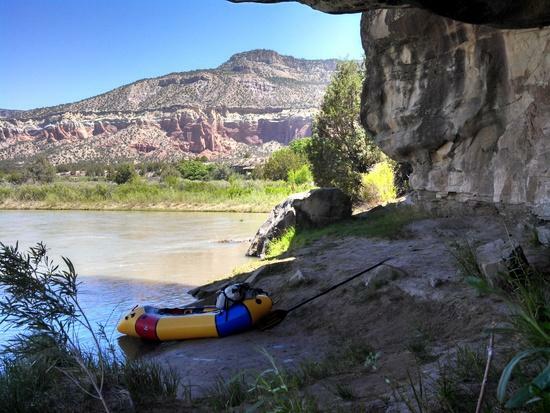 The Verde and Gila both had potential loops, but meager run-off flows crapped out just as my public teacher schedule would allow me to float through spring-break. 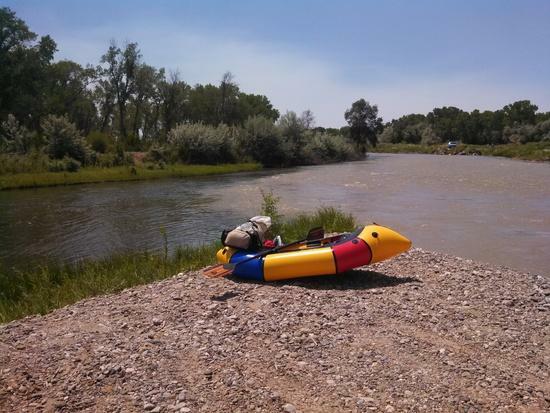 That left me waiting for summer break, and I found my boatable flows on the Rio Chama and Rio Grande. Segments of these rivers form the northern and eastern boundaries of the Jemez mountains topped with the remnants of a massive ancient volcano now known as the Valles Caldera. 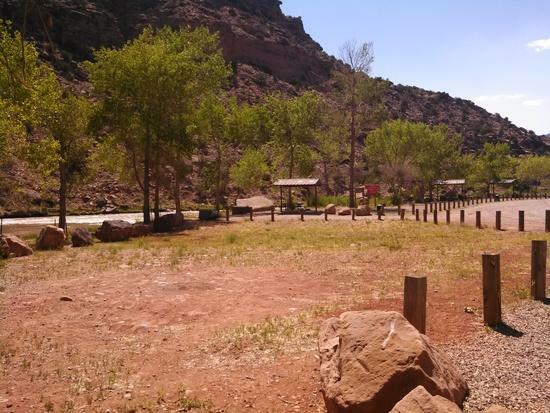 Scott Morris of GET renown, had posted a new long trail called the Northern New Mexico Loop, and the first 100 mile segment connected a logical takeout on the Rio Grand with a put-in at Skull Bridge on the Rio Chama, the last 30 miles or so following the CDT. With Scott's research and water-table my loop was ready made. I would start in early June midway through the hiking portion so that I would have a respectable hike/float/hike trip of almost 200 miles. Summer finally came and I had made arrangements to leave my car behind Ammandas Country store in the only hamlet in the Jemez during the 10 day trip. Then 3 days before my planned start, watching the local TV news I saw the familiar inside of Amanda's filled with evacuees. Another forest fire had started just 2 miles from the store, closing several of the trails I needed to connect rivers. I knew a previous fire had blown to more than 350,000 acres 2 years before and I couldn't think of leaving an unattended car for 10 days even if I found an alternate route. 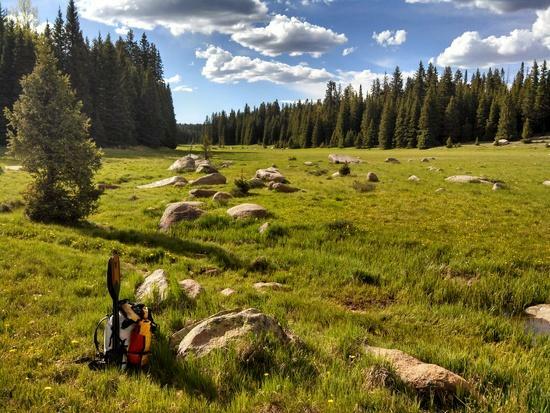 My plan morphed into a giant point to point hike where I would start on the far western edge of the Jemez mountains where trails were still open, hike to the CDT and then follow my original route to the Chama river. From there I would float as planned, but continue past the (Scott Morris) takeout and continue across Cochiti reservoir and down the Rio Grande as close to Albuquerque as I could get before taking public transportation to the track Amtrack train that would take me the final 135 miles home to Gallup. 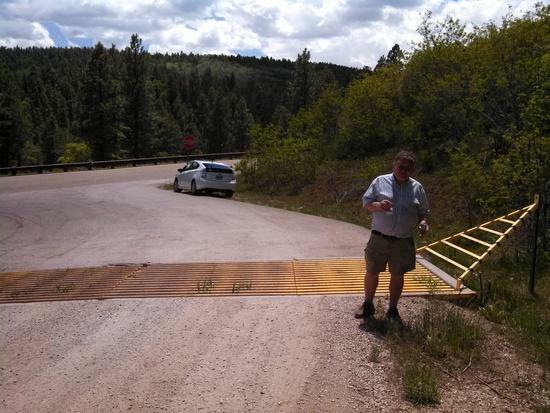 My father was the MVP of the trip agreeing to drive 7 hours round-trip on 2 days notice to drop me off at the start of the hike high above Cuba, NM. Finally, I was on trail at 2 pm! My HMG wind rider weighted 27 lbs as I started. 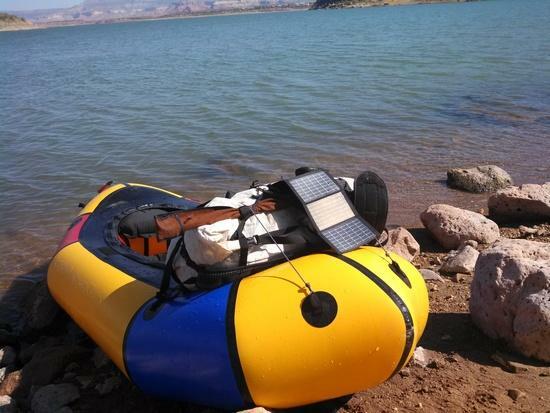 6 lbs baseweight, 11 lbs of packraft gear, and 10 lbs of water/food. Several miles of forest road brought me to the San Pedro Parks Wilderness. With evening approaching I continued several more miles up through the soggy parks along the Rio del Las Vacas, fishing occasionally in bigger pools for an invasive brown trout for dinner. No luck on that but as dark approached I reached the trail intersection with the CDT and my planned first camp, 15 miles from dad's drop off. Rounding the final bend to my surprise I found a tan tarp/tent set in poor style just 2' from the trail. "Uh…, hi guys! Where you headed?" "Canada!" 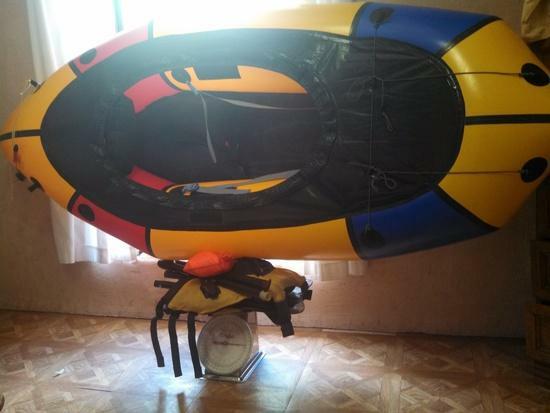 was the enthusiastic reply followed by, "is that a packraft?". 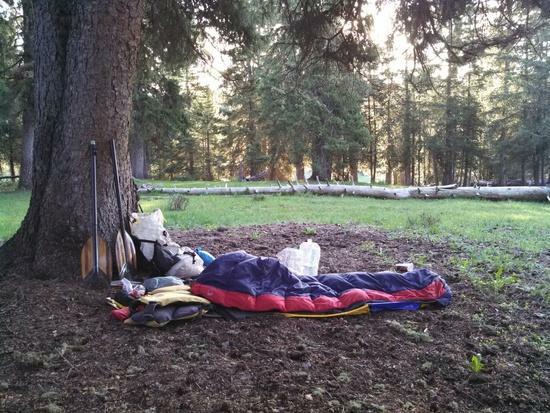 After a brief chat I headed up the slope to find a big spruce to sleep under. The spinnaker tarp would be dead-weight the entire trip as great weather demanded cowboy camps the entire trip using a 1/8" GG pad on the yak. 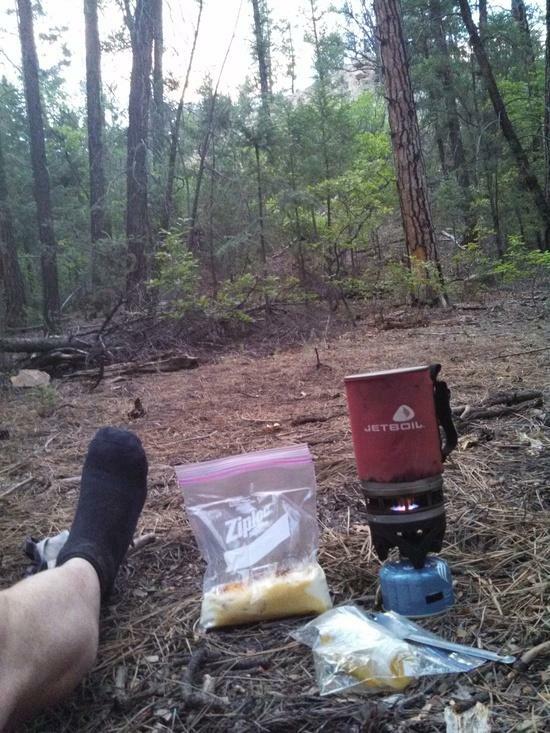 Day 2 started comfortably after dawn and I wondered how my feet and I would fair on the 25 miles of CDT to Ojitos Canyon. A few miles brought me to the nondescript highpoint of San Pedro Parks, where far to the northeast I could see Abiqui reservoir and the sandstone canyons of O'Keefe's paintings shrouded in the smoke of the Thompson Ridge fire (on its way to burning 25,000 acres). I would paddle through there 2 days from now. 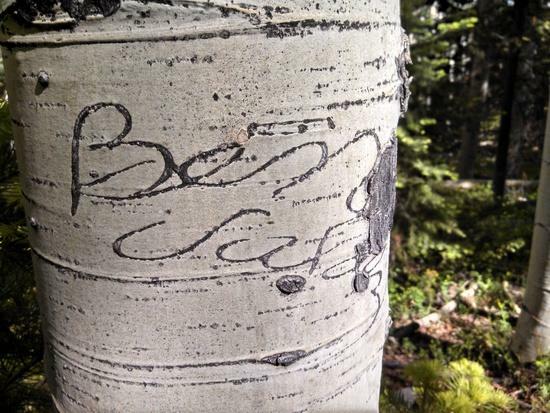 The trail then descended from Spruce-fir, through thick blow down to aspen trees beautifully engraved with Hispanic surnames and dated in the early 20th century. I've never seen such fine lines in tagging that old! 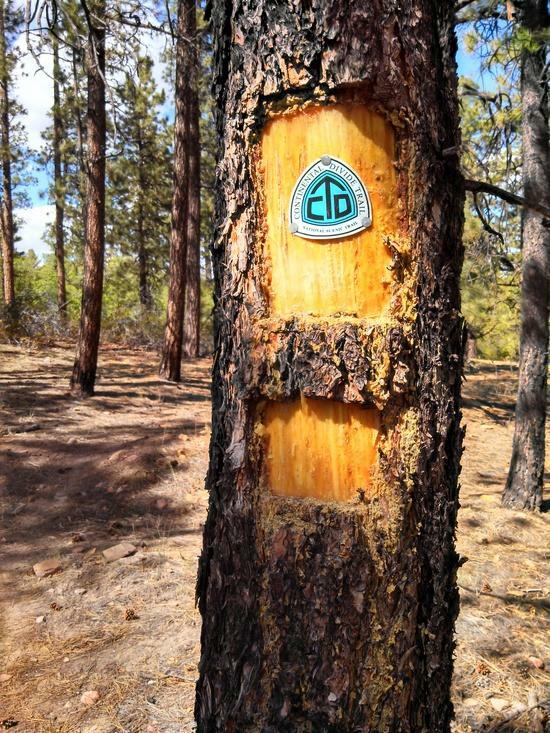 I continued down along CDT trail built by friend Strider Brown and crew as the aspens gave way to ponderosa. Refilling at another small creek with cutthroats, I began the 15 mile waterless stretch as the temperature climbed into the 90's and ponderosa gave way to dusty pinyon-juniper and then sage flats. 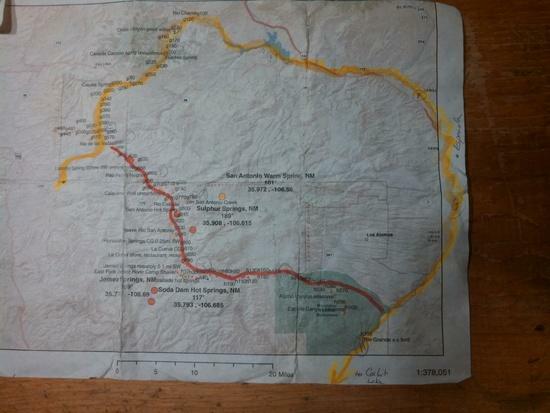 I passed the miles watching 2 familiar shoe prints of what I assumed to be thru hikers from a day before. They stopped here, peed there. I wondered what the 2 hikers I'd seen the night before would think of my gait. 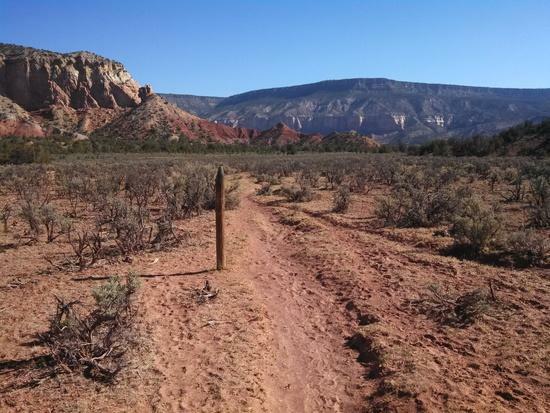 The sage flats marched straight towards a 1500' sandstone bluff, which the trail climbed straight up. Exposed to the early afternoon sun, the trail reduced me to footsteps no longer than my own shoes before the top. Once again in the shade of ponderosa I passed a beautfully new CDT trail shelter as the trail gradually descend the mesa. Now only 5 miles from camp and water I knew my feet would survive the day and the walking was easy as the trail followed double track before a steep drop off into Ojitos canyon. I camped just above the trail confluence with Ojitos creek with maybe .25 CFS of tasty clear water. I was pooped as I demolished potato flakes, bacon, and cheddar gruel. Last minute stage 2 fire-restrictions forced me to leave all the nifty alcohol stoves at home and bring the trusty 9 year old jetboil. 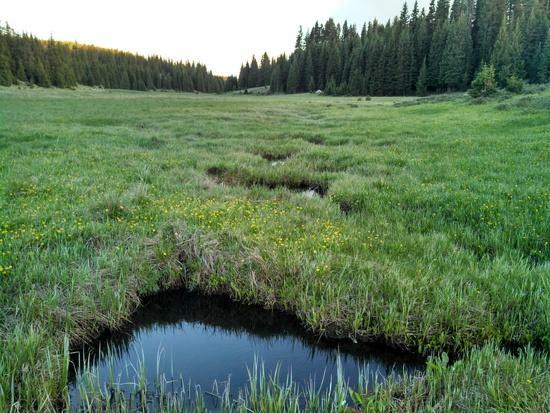 The next day brought 4 miles to the edge of the Chama River Wilderness and a great trough-spring alternative to the sometimes silty river. I guzzled the sweet water under the surface mat of algae after a quick zap with the steripen. With 2 more liters on board i crossed Skull Bridge and then followed the dirt road 4 miles upriver to the put-in near the monastery. The road cutting through the heart of the wilderness upriver to the monks place was busy with rafting companies as the Chama was the only river in the state with boatable flows (800 cfs out of El Vado) in the state at the time (early-mid June 2013). I turned down several rides and ate much dust, but was inflating the boat by 11 am. I rigged quickly and launched to escape the put-in crowds, planning to stop for a rest break under a big over-hang a mile or so downstream. After several minutes, a snack, and taking the photo above I could hear a big commercial trip coming downriver I hurried to launch knowing that my paddling carried me faster than the rafts. But first I wanted to checkout the modern petroglyphs on the face of the overhang. Bzzzzxxxx was the piercing sound at my toes. Lunging my feet instinctively back and pushing off the wall a younger (2') rattlesnake struck toward my Roclite 295 and Houdini pant covered legs and feet. 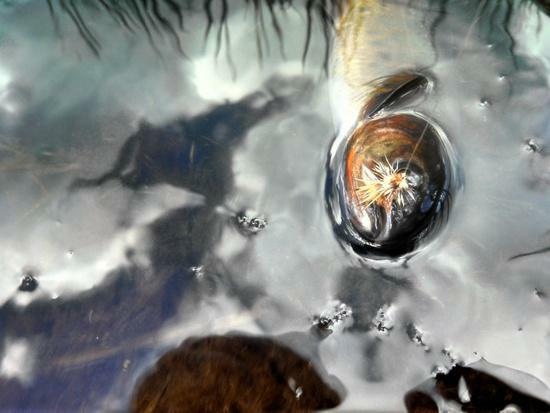 My heart raced as I landed, the snake now coiled again. I stumbled back towards the boat checking myself stunned I wasnt bit. The snake continued pretty nonchalantly across the base of the rockwall as a voice from the river called, "Did you just get bit?" 18 years in the SW and I've never had such a close encounter. I was shaken and should have been more alert. 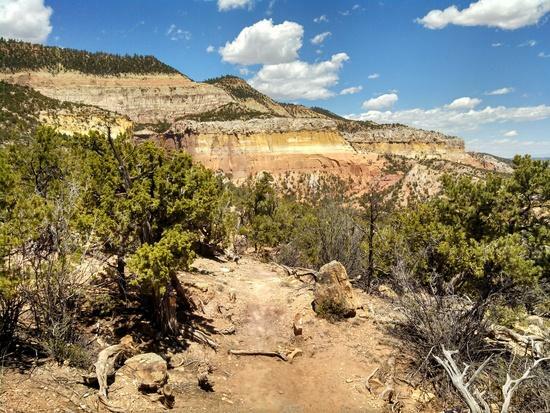 I launched and paddled through the adrenaline and the frequent class 2 rock gardens on this 10 mile section of the Chama known as the permitless day-section below the 20 mike lottery BLM permit section through the Wilderness upriver, starting just below El Vado reservoir. A family who had offered a ride up the dirt road and launched before I did was on river right as I paddled past and offered lunch. This time I accepted. 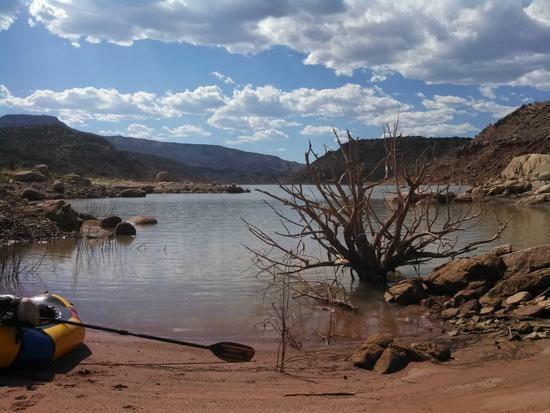 Refreshed I paddled the 10 mile run to Big Eddy take-out, used their groovers, dumped trash and then left the crowds behind as I floated the 5 inaccessible miles of canyon water before reaching the tail end of Abiquiu reservoir. Warnings at Big Eddy stress that full size rafts could be flipped by winds on the lake. 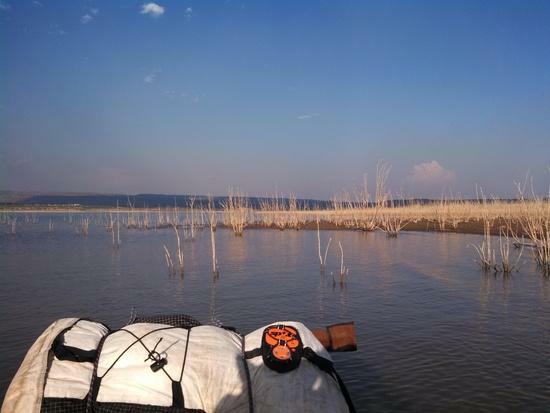 Winds were calm, but I still felt pressure to 'make hay..' as they say and I paddled throughout. 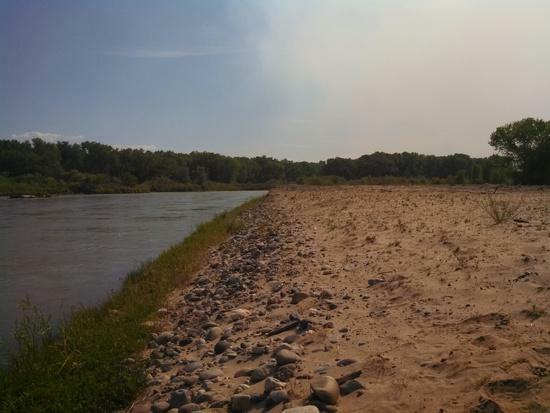 Man, nerves must have kept me hydrated and nature called again after running 2 of the best rapids of the day, and so still spoked by snakes, a mid-river gravel bar offered a perfect snake-free pee break. And then, I couldn't believe it. 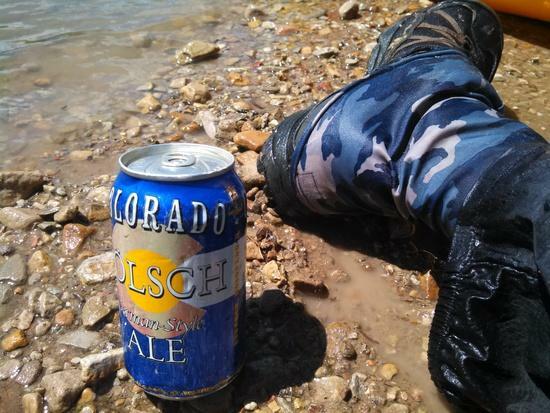 Amongst the water and rocks bobbed a clearly unopened Colorado beer. Surely it was punctured somewhere. Filled with a hot skunky mix of river and beer. Nope, full pressure. I had just found a beer! 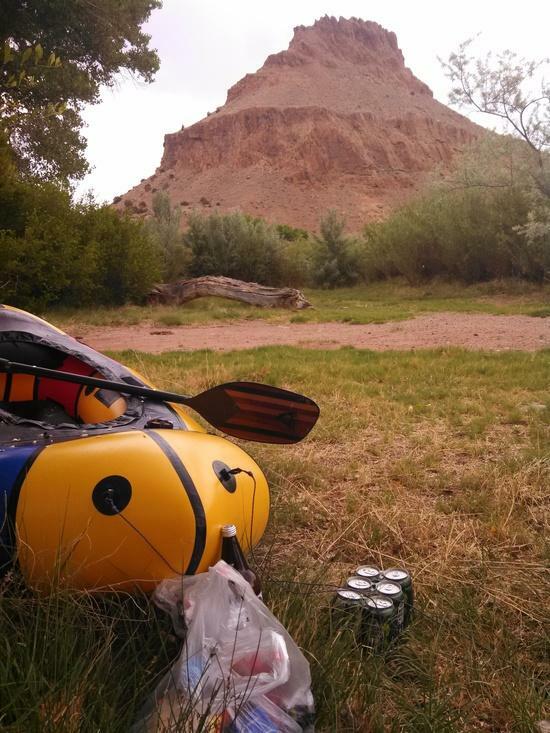 That's the major difference between regular rafting and packrafting: beer. This was the best river booty I have ever found! I just sat in the shallow water, Houdini pants (for sun protection) soaked and savored the scene. 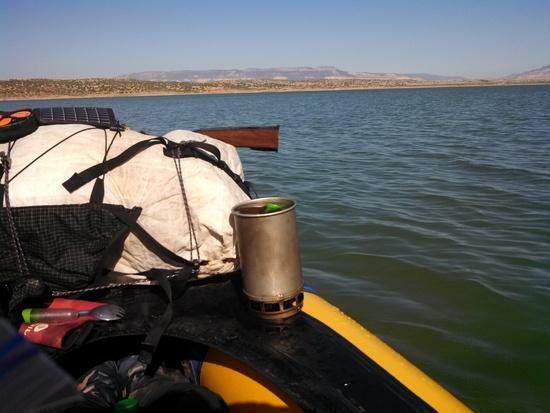 10 flat miles of Abiquiu reservoir lay ahead. I planned to camp somewhere mid-lake. The huge gentle whirlpools as the turbid river water mix with the clear reservoir where a trippy paddling sensation, and then calm. No wind at all. I started paddling and paddling the squat, now little feeling yak. Repeat. 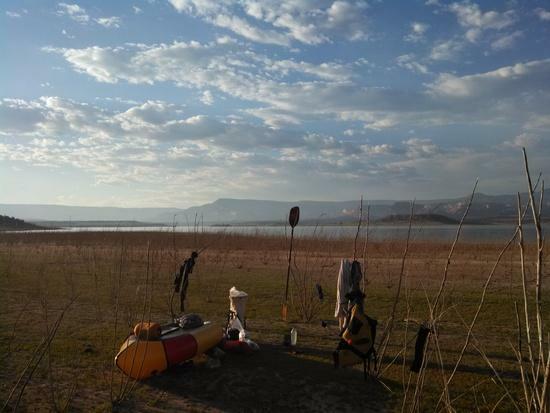 I paddled for 5 hours amongst the canyons and bays (and cigar-boat clubs) of Abiquiu into a growing headwind before making camp on the east shore mudflats. Interestingly the flats created by fluctuating water levels were covered with flooded-dead willow timber and a carpet smooth covering of baby grass. Bare (pruned) foot paradise! The sunset directly over O'Keefe's Ghost Ranch, and all was good. Except for searing forearm muscle pain during the night. I took big ibuprofen and never bothered again. Day 4 dawned early with no canyons or mountain about and I struck out early to cross a 3 mile section of open water across to the dam before the winds blew. It was an exhilarating feeling to be in the yak, a mile from any shore. So I 'made' some water while it was clear and sediment free. I paddled towards the bluffs 2 miles away, and as the waves briefly began to crest in small whitecaps I found shelter in the dam-side bluffs. Too steep to climb, I paddled south in front of the dam to the next cove south and then beached, checked for snakes, and packed the raft for the 2 mile hike around and over the dam. The highway hike approach to the dam provided a great view of the mainstem of the reservoir I paddled that morning. Grape nuts brunch at the overlook led to the switchback road descent to the river below the dam. Passing the Army Corps of Engineers headquarters I couldn't help but notice the irony in their pride in capturing a Wild and Scenic designated river behind their dam. The summer sun baked on the patina covered canyon walls and I was cranky. At the bottom of the dam the river reemerged and I reinflated at a deserted huge picnic area for winter trout fishing. It was HOT. 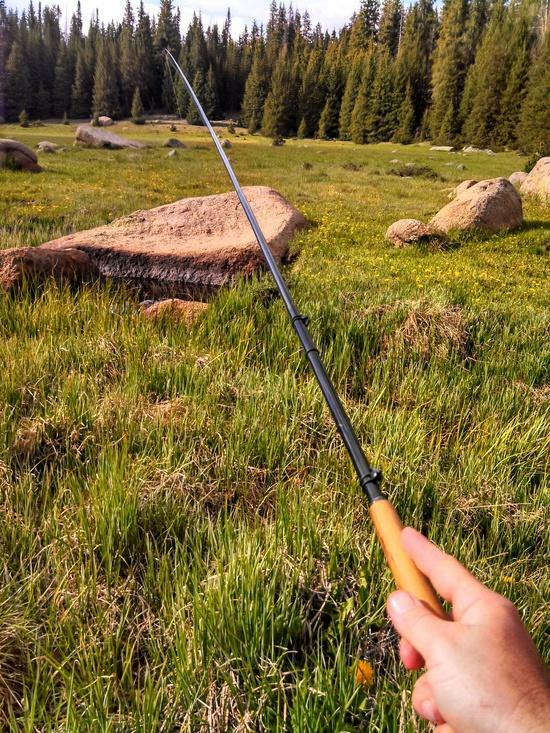 But u still broke out the tenkara rod for some fruitless fishing. 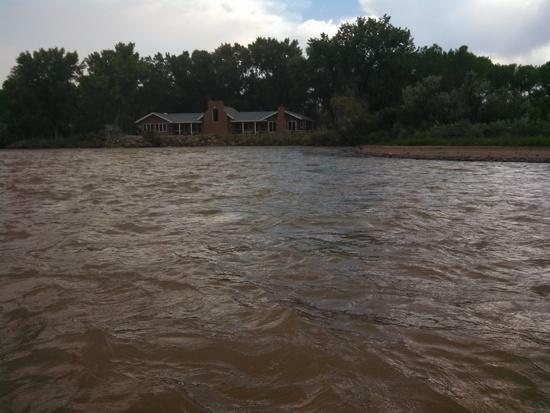 The bosque's cottonwoods were shedding cotton as I floated downstream towards the town of Abiquiu and the first of a dozen or more portages around irrigation check dams, but first a river- wide fence built by the government!?! 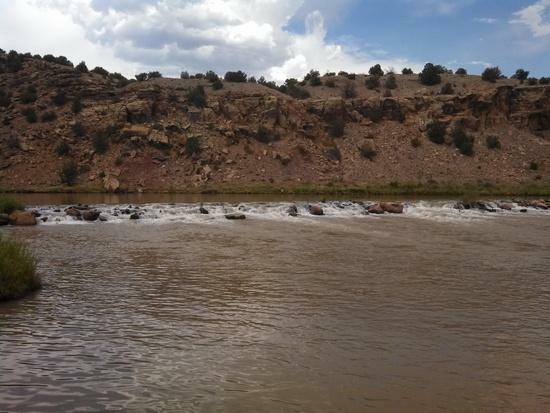 These check dams (14 or so) would punctuate the next day and a half and 20 + miles of the Chama until its confluence with the Rio Grande. Most had chutes runnable in a hardshell kayak, but the preferred method of concrete debris and rebar construction left me evaluating and warry of every dam. I portaged them all. A couple were pure low-head dams with hydraulics capable if holding even kayakers. Be careful, dude! 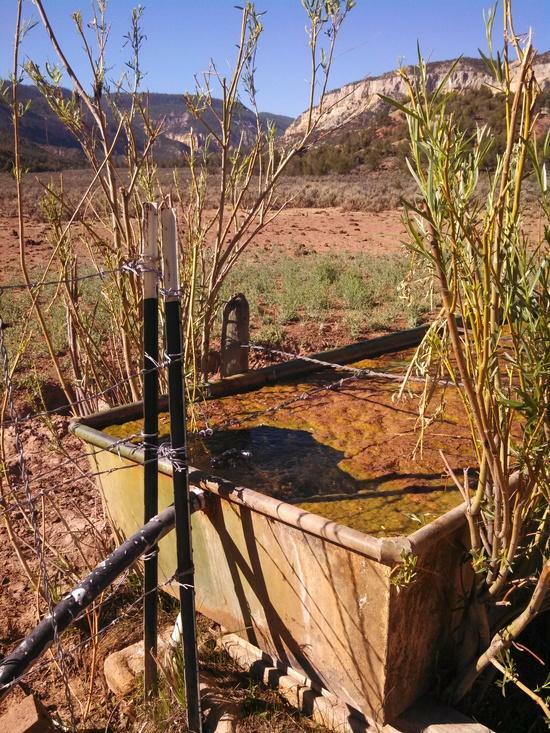 After maybe 5 miles of river flowing through agrarian backyards I reached Abiquiu township, and its 1 gas station/ store where I was to top off my supplies. I ditched the packraft under the bridge and walked a quarter mile in light rain. Beer and curry says it all. The rest of the afternoon float through the valley was obviously great. I found the first of the BoR's jetty-jacks in an eddy just downstream of the next check dam. Rural properties of true agrarian use gradually gave way to let's say, residential trophy agrarian use. All with remarkably little free-board above river level. Monsoon floods 3 months after I floated by claimed several homes I passed. A long day 4 came to a close and I searched for a take out where I could camp in the dry hills away from the mosquitoes of the bosque. I found just that on the edge of a fallowed chile farm, hidden from view by a hill. At sunset I relaxed and watched columns of smoke billowing from 2 fires high in the Pecos wilderness to the east. Day 5 I awoke to a coyote tracks over my own from the night before, but otherwise a familiar routine; coffee, poop, throw everything in the hmg bag double-lined with compactor bags. Launch. Paddle. Hide from sun. Unpadded cycling gloves, OR sun runner hat, long sleeve nike fit shirt, and the pat. wind pants were invaluable sun and bug protection. 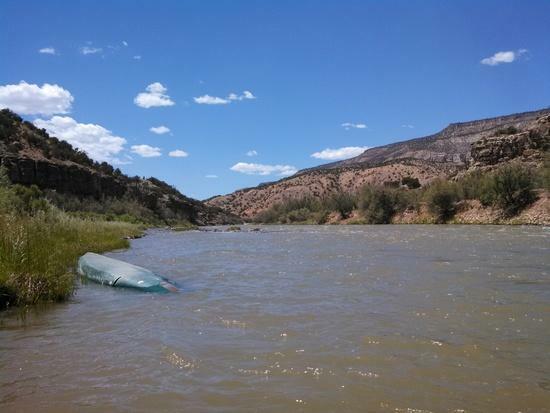 Today's float will be the end of the Chama, and onto the Rio Grande. After turning south I would stop in riverside Espanola, NM for a green Chile cheese burger at Blake's (nonnegotiable part of the original plan). But first more check dams. The last 2 portages would be around low-head dams that would be dangerous to be washed over. Exit river left on bath. 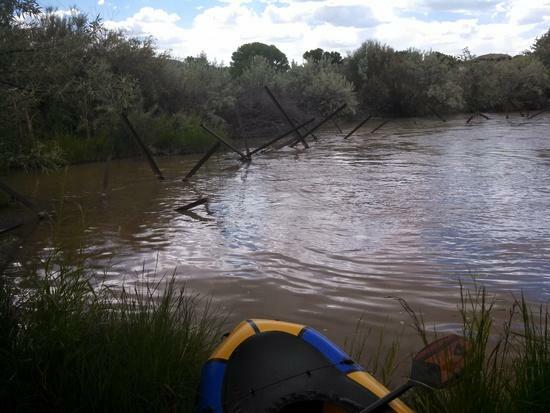 The last of which and many other of these check-dams had thorny (2.5") and fast current relaunches through the Russian Olive that dominates the bosque understory. 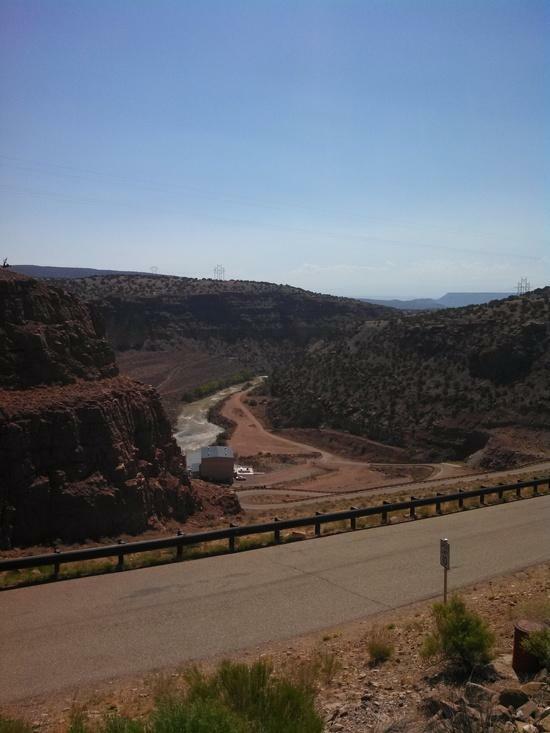 The confluence with the clear-green Rio Grande was anticlimactic after realizing the now turbid-tan Rio Chama was carrying 80% of the flow that would carry me toward Albuquerque. Several miles of flat water brought me to Espanola and a walk into town for lunch. Empty bottles and syringes under that bridge convinced me to roll the raft and bring it with me. Also of note, the Powerfilm+usb solar charger had failed to charge my razor M phone, and I was resorting to try and buy 2AA's to charge it. Burger and batteries was my mission as I walked down main street. The casino sign said it was 96 degrees. After a 3 mile loop through town between bridges I relaunched floating through Santa Clara pueblo and their extensive bosque restoration areas. The following pic is my last photo because the alkaline batteries just made the solar charger hot, and my phone gained a single percent of charge. Note the smoke-zone in the sky to the west. 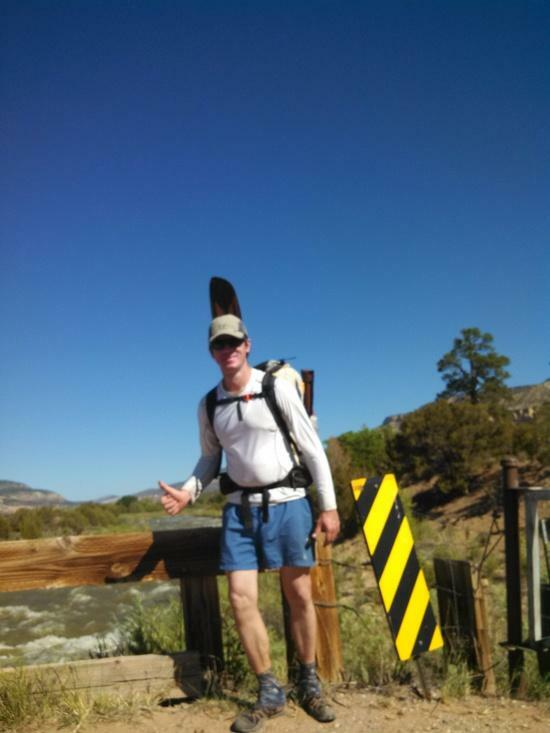 I floated 15 or so miles down into the black canyon below Otowi bridge between Los Alamos and Santa Fe before making camp at Buckman wash for the night. "There's an aggressive mountain lion in the area, it jumped at one of my employees this morning?" I interrupt, "Hey man are you serious? I'm floating this river and don't have a vehicle to leave; are you messing with me?" The conversation continued and he told a story of a lion lunging toward a worker with a fence between the two. I said I needed to return to the river for water and he said I couldn't drink the water motioning towards Los Alamos on the bluffs above, but I couldn't help but think that he was there guarding Santa Fe's pumping of the same water. I assured him I could treat the water and he daux he had to drive further to warn and ticket some litters. 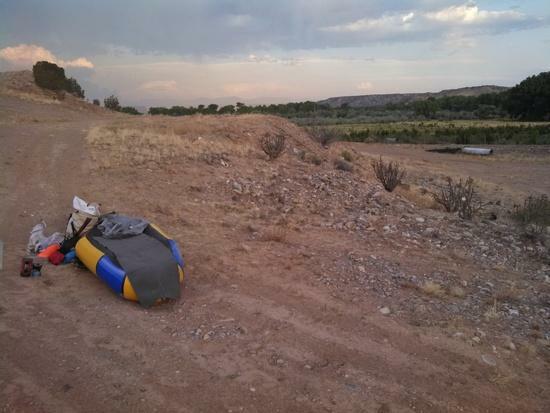 I decided the guy seemed overly hyped up and paranoid in general and Iwasn't going to float downstream with the sun setting nor bum a ride to SantaFe with the cop. 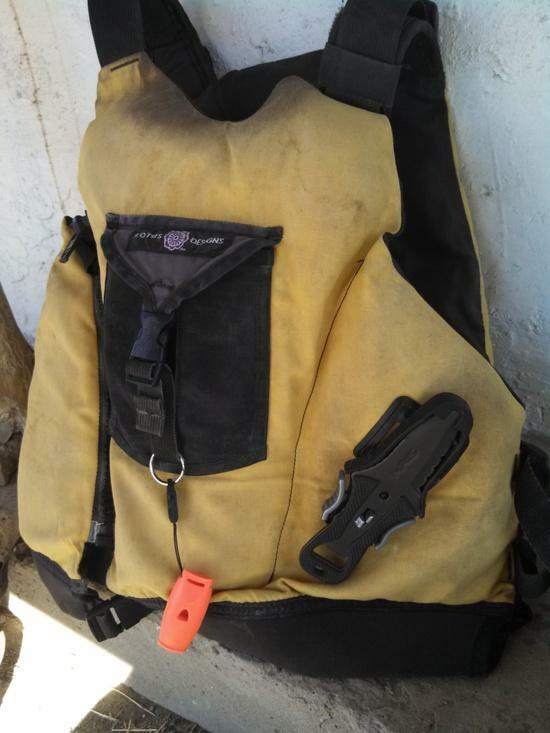 So I went through the salt cedar bosque for water like a gladiator wearing the pfd, with paddle and river knife drawn. Then I moved my camp way away from the river and right next to but hidden from the access road. Blue lights lit on the canyon walls around 10 that night, but after a fitful early night of sleep, I crashed hard and awoke alive. 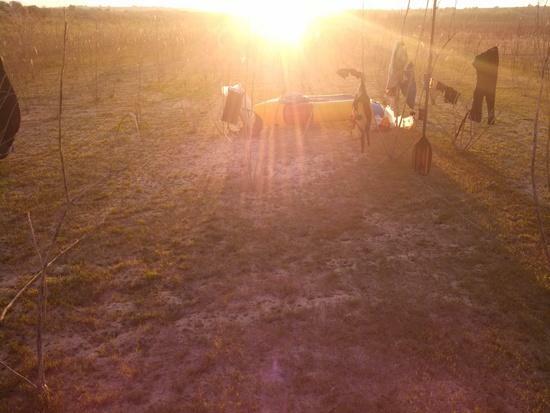 Walking back through the salt cedar to put in the next morning I was stunned to see 3 full NRS rafts being rigged. Government types really wouldnt even smile, but there shuttle driver chatted a bit. Some survey mission. 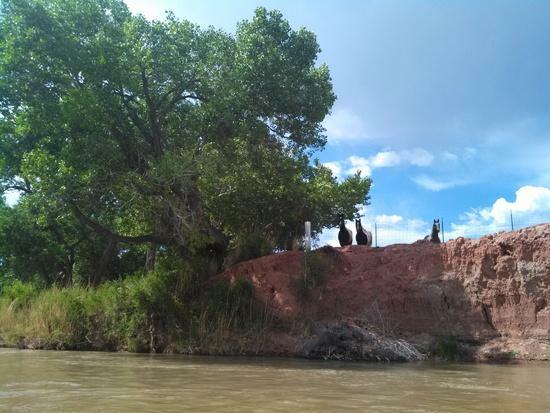 They would take 2.5 days to float through Bandelier National monument and across Cochiti reservoir. 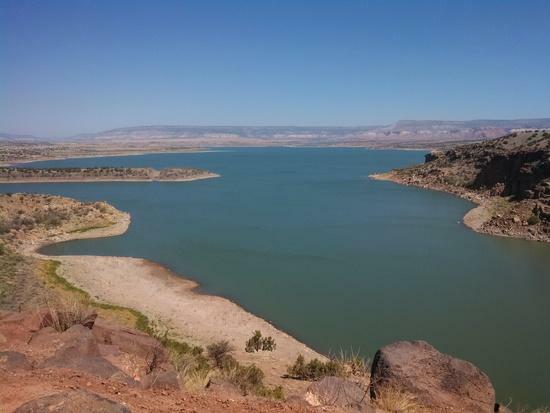 My plan was to get across Cochiti by yhd end of the day and across the dam to the bosque below for a river camp. They did perk up to remind me that the county below Cochit had enacted full wildfire precautions and closed the bosque through to Albuquerque. $5000 fine. So it wasn't a hard decision, today would be my last day of paddling. 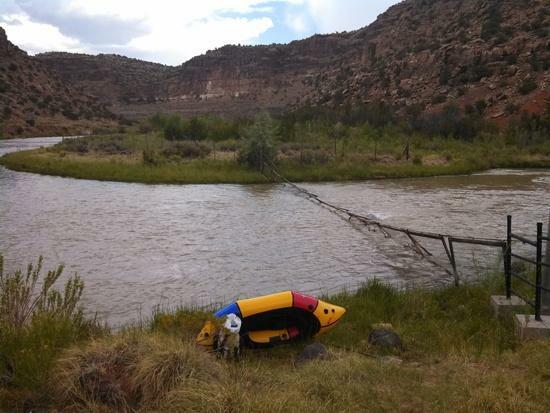 Class 2 packraft candy led for several miles to Frijoles canyon and its rapid. A solid 3 with 2 maneuvers around holes at the start then a 1/4 mile of pinball run out was by far the best whitewater of the trip. 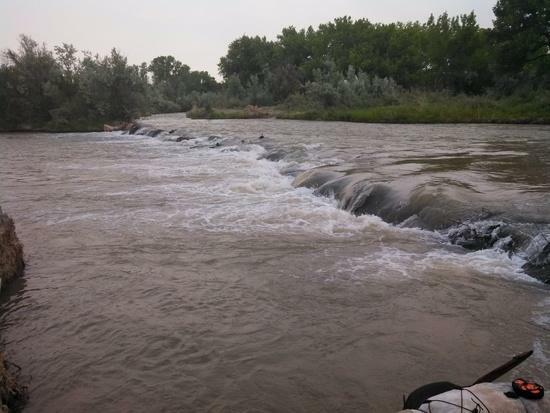 Several miles of sandbar weaving followed as the water slowed and the effects of Cochiti made themselves known. 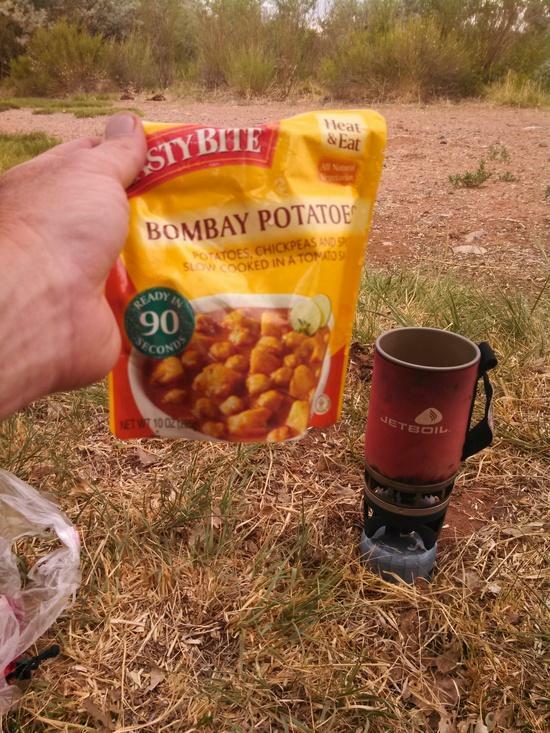 I looked longly at my ooriginal planned final takeout, and the start of a 30 mile rugged hike back to Amanda's Country Store as I paddled past Capulin Canyon. Once on the 5 mile reservoir, the wind blew hard forcing fast smooth strokes and hugging the blocky boulder strewn cliffs and shore on the western side for breaks and shelter from periods of ripping gusts. By 4 pm i had crossed the lake to the state park marina and campground. I don't think I've paid $12 for any campsite in a decade, let alone a sunny, windswept concrete pad, but I didn't hesitate for a second to go into the air conditioned booking kiosk and listen to the silver fox tell me about the closest showers and bus schedule to catch the trains home the next day. That night I washed my only respectable travel clothes (pat.Houdini top (silver, pre-2013) and bottom(black) in the sink using all .25 oz of peppermint Dr. Bronners soap. They smelled good but were barely clean. I felt like royalty after a shower and slept like a rock. Day 7 would take 12 hours of travel by bus ($2), Railrunner ($3.50) and Amtrak ($27) trains to cover 200 miles home. I walked the 10 minutes home from the train station as the sun set. By car its only 3 hours, but it still could have been the best day of the trip. Awesome start! I cant wait to read the rest. Blake's! Gotta get me some next time I'm in Gallup. I love that area; try to get up there every summer. Thanks for taking me along vicariously! Awesome trip Kevin, thanks for writing it up. Never heard of jetty jacks before, they look nasty. 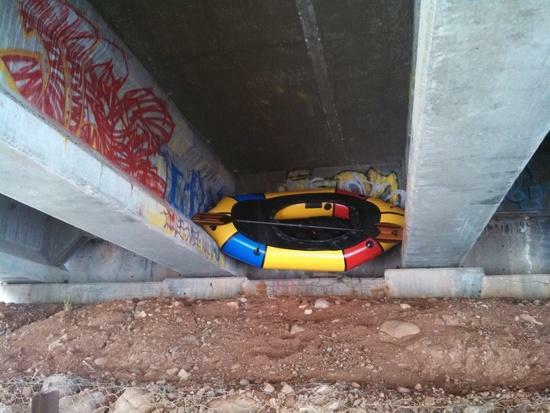 Meant to catch flood debris? 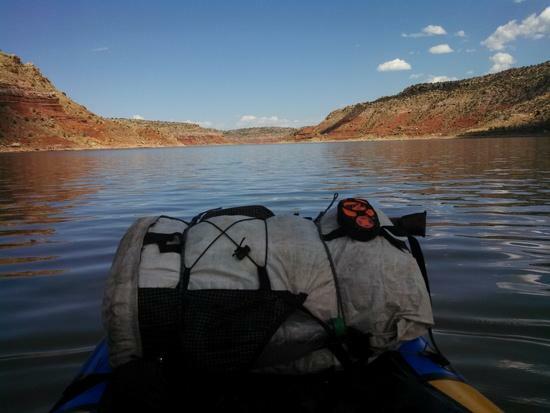 Good to see packrafting in NM. Thanks for sharing this Kevin. "Jetty jacks" were built along the Rio Grande to help protect sensitive bosque habitats, like those you see in the ABQ/Santa Fe region. You see them dotted along stretches of the Rio Grande, north of Socorro, NM usually, and they were intended to decrease riverbed sediment erosion during high surface water runoff events and seasonal flooding. I planned to, but never got back out there this season to finish the hiking section after the Thompson Ridge fire burned out a month later. Also,the NM Railrunner trains are connected to the regional bus network I took from the town of Cochiti lake to Bernalio RR station. A ticket from the train will get you free bus fare. And, I learned a bus route even goes the 70 miles out to Cuba or Jemez Springs (just a few miles and several hotsprings, below my original route starting in La Cueva). Meaning I could have started the whole trip riding the Amtrak from Gallup (or any Amtrack station) to Albuquerque. $3.50 for the Railrunner would have taken me to the CDT in Cuba. 8ish miles from the door of the bus and you'd be up in the parks wilderness. 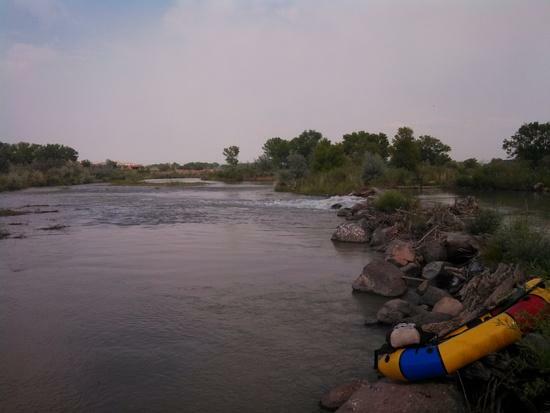 And lastly, the preferred exit to the whole trip would be to paddle the Rio Grande south from Cochiti reservoir to downtown Albuquerque, and then just deflate and walk to the train station or airport. This was a great writeup. Thanks for shraing! Nice trip. 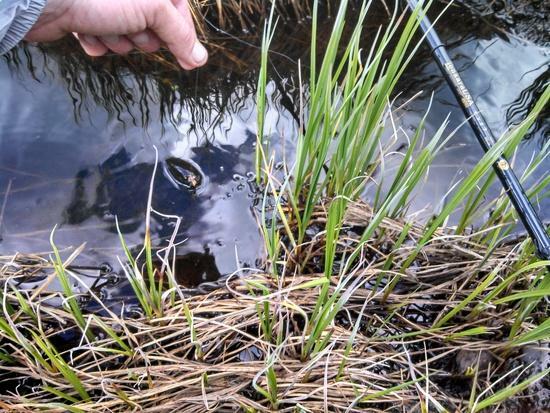 I remember seeing trout in what seems like that very park in the San Pedro Parks wilderness while hiking the CDT and wishing I had my rod. Very cool. Congratulations for your trip. Thank for sharing David. because this was a darn fun adventure and reminds me of the days when pictures were easy to upload and trip reports abounded! And I appreciate it now. 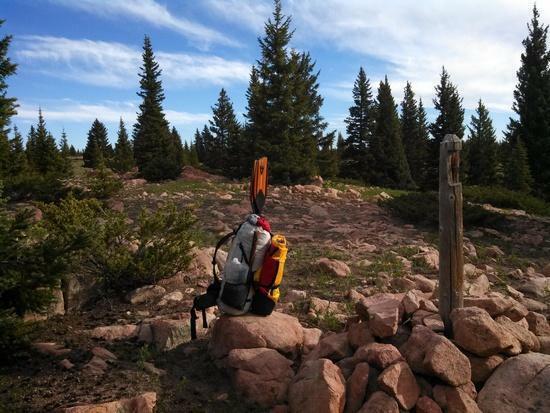 Thank you for Sharing your well written and very interesting trip report! 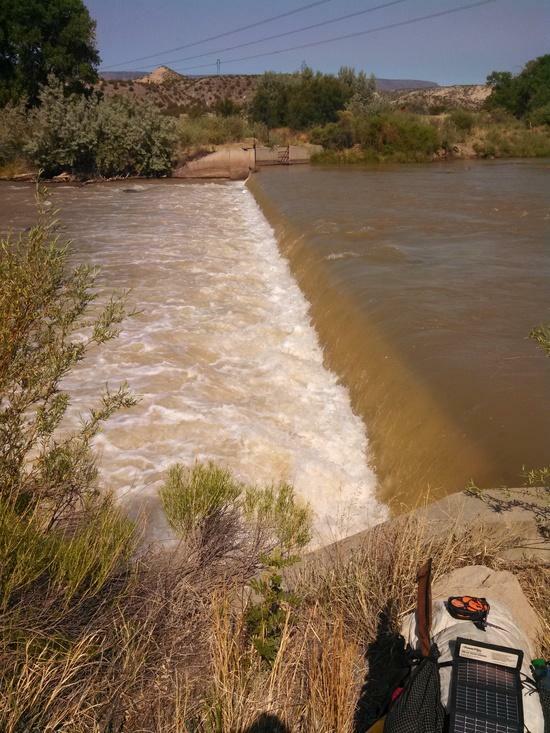 Quite a trip down memory lane despite being only a few years old….. especially the memories of those cigar/speed boats roaring past my packraft on Abique reservoir, and the ridiculous encounter with the pump station guard and his mountain lion story. Oh, plus that beer i found floating in the eddy… its still the best tasting beer ive ever had. Sadly I’m reminded that a couple of Forest Fenn’s treasure hunters lost their lives in the past couple years in the canyon run above Cochiti reservoir.